SEPTEMBER 2018 • FOODSERVICE EQUIPMENT & SUPPLIES • 95 The city of San Francisco goes above and beyond the state law, requiring proper separa- tion of recyclables, trash and compostables for all generators of food waste. Seattle has a similarly strict rule. The city's 2015 ordinance prohibits all food waste from garbage streams for both residential and com- mercial disposal. Fees may apply if more than 10 percent of businesses' garbage contains food waste, food-soiled paper, or other items that could have been composted or recycled. The ordinance also requires busi- nesses to either compost their organic waste on-site, self- haul, or pay for a food waste service. Also on the West Coast, as of April 2014 in Portland, Ore., "food scrap-generating businesses shall separate all food scraps from mixed waste and set out for collection (e.g. compost, ani- mal feed, or where possible, human consumption)," according to city law. "BPS (Bureau of Planning and Sustainability) shall de- termine which businesses are subject to this requirement based on estimates of the amount of food scraps generated. To be in compliance with the recycling requirements, a business shall not have any recycling in their mixed waste and, if applicable, no food scraps. If these conditions are not met, the BPS will be responsible for implementing the following best management practices. BPS may also establish supplemental best manage- ment practices for businesses to implement as needed to come into compliance or if a business wishes to further improve recycling and waste prevention." Farm Bill One may think the farm bill would have zero impact on foodservice operations, but quite the contrary. 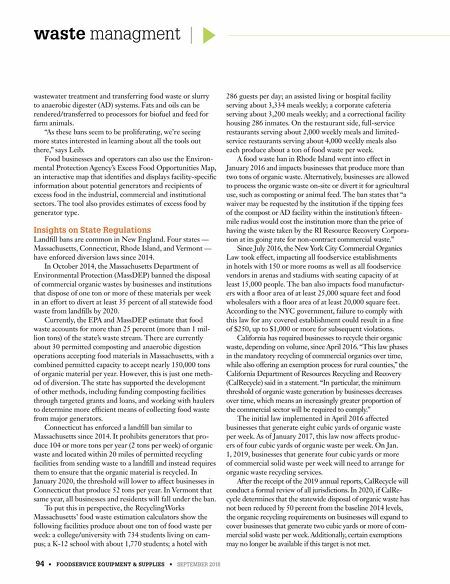 In fact, the FLPC published "Opportunities to Reduce Food Waste" in the 2018 Farm Bill last year with this in mind, outlining ways to incorporate food waste measures into legislation. Separate House and Senate versions passed earlier this summer, but a conference committee will need to work on consolidating those drafts into one bill for a future vote. That date is unknown, Leib says. Some of the FLPC suggestions were included, while others were left out, such as guidance around standardizing expiration date labeling and creating an Office of Food Waste Reduction within the federal government. Still, there's room for these addi- tions during the time the bill remains out to committee. One might wonder, why would FLPC and other in- terested parties address food waste issues in the farm bill? "The last farm bill in 2014 called for a half trillion [dollars] of mandated spending on food production and food stamps over the course of five years, but it did not address ways to divert food waste from landfills, Leib says. "As both the USDA and the EPA have shown interest in supporting food waste reduction, the farm bill seems to be the best vehicle right now for getting money to the states to help build pro- grams and systems dedicated to that effort." One positive step toward food waste reduction included in the bill: According to the FLPC, the first draft of the Senate's version of the farm bill allocated $10 million per year for The Emergency Food Assistance Program (TEFAP) to support proj- ects "harvesting, processing, or packaging" donated agricultural commodities. States can use this funding for projects that reduce the waste of agricultural products through donation, provide food to food-insecure individuals, and create new partnerships to distribute food to those in need. This program made it into the final Senate bill, but with funding of only $4 million. The Senate's draft version of the farm bill also included $25 million per year for pilot projects in at least ten states to support the development of local composting and food waste reduction efforts. It also called for a study to evaluate the available methods to measure food waste, standards for food waste volume, and fac- tors that cause food waste, and includes a list of additional topic areas for the USDA to study, such as the cost and volume of food loss of domestic and imported fresh food products. The Senate farm bill also includes strategies for reducing on-farm food waste, but in regard to foodservice operations specifically, the bill provides some clarity around liability protections for food donation and allows for food donation directly from certain donors to individuals. According to the FLPC, this amendment is based on a portion of the Food Donation Act introduced earlier this year, which instructs the USDA to provide guidance as to liability protections for "qualified direct donors," such as retail food stores and restaurants with food safety certification and licensing when donating surplus food to those in need. This is huge; if the bill passes, restaurants and other foodser- vice operators can have a bigger hand in sending excess food to food recovery programs intended to feed Americans in need. For many, it's a dream that is coming true: more legislatures on the city, state and federal levels coming together in a bipartisan fashion to address food waste on a more aggres- sive plan with a clear path. While many issues (e.g., climate change) continue to pose incredible controversy, the prob- lems of food waste and food insecurity in this country, it seems, can no longer be ignored. 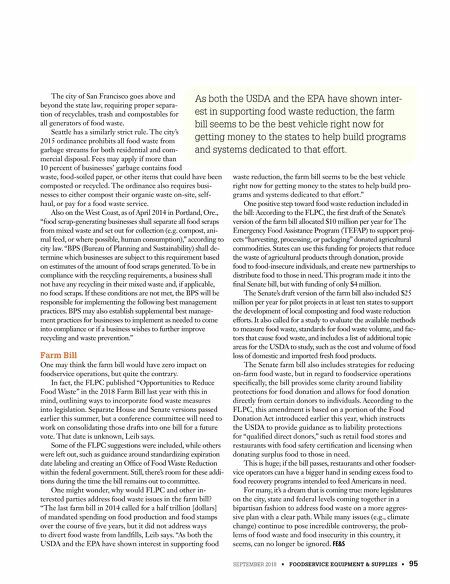 FE&S As both the USDA and the EPA have shown inter- est in supporting food waste reduction, the farm bill seems to be the best vehicle right now for getting money to the states to help build programs and systems dedicated to that effort.